Delaware Christian’s Curtis Bean lofts a shot over a pair of Patriot Prep defenders during the first half of Thursday’s non-league showdown in Delaware. DELAWARE – With junior Pryce Johnson sitting on the bench because of an ankle injury, Delaware Christian boys basketball coach Jon Landrum was concerned about his already small team’s ability to rebound against bigger, more athletic teams. Johnson, who is DCS’ tallest player at 6-foot-2, was walking with the aid of crutches before the game. 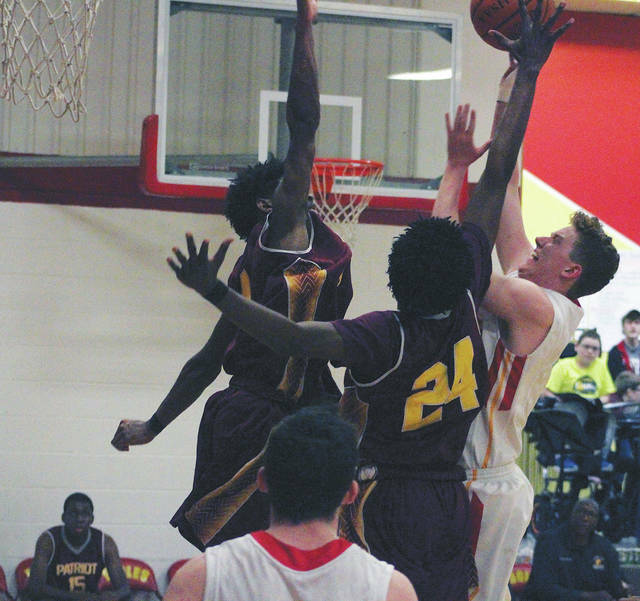 Pryce’s teammates, led by younger brother Dayne, were up to the credo, out-rebounding visiting Patriot Prep in a 72-51 win in non-league play Thursday night. DCS pulled down 45 rebounds, including 18 on the offensive end, to win the rebounding battle by 13. Dayne was responsible for 14 of them and scored 16 points to tie Nathan Stewart for the team lead. “I know (Patriot) has a tough record and they’ve played a really tough schedule,” Landrum said. “But they’re really tough and they’re really aggressive and that’s where we’ve struggled in the past. Stewart scored all of his points in the second half, including 12 in the third quarter after sitting most of the first half with foul trouble. Curtis Bean had 15 points, six boards and five assists and Walter added 10 points and four steals for DCS (5-11). Bean broke a 12-12 tie with a 3-pointer with 16 seconds left in the first quarter and DCS led the rest of the way. “After a rocky start, I thought we were really disciplined, didn’t dribble (to try to get out of pressure), passed the ball and attacked when we had the number advantage,” Landrum said. Bean and Stewart led an 11-0 run that pushed DCS’ lead to 49-32 at the end of the third. Justus Seward had 20 points and seven rebounds, LA Pratt added nine points and Desmon Williams had a team-high eight rebounds to go with six points to lead Patriot (3-9). DCS returns to action Tuesday night, hosting Genoa Christian in non-league play. It is scheduled to start at 7:30 p.m.
Buckeye Valley outscored host Pleasant 10-7 in the fourth to force overtime, but couldn’t get much going in the extra session on the way to a 37-35 MOAC setback Thursday night. Hannah Cowan led the Barons (8-8, 6-5), who had just four points in OT, with 14 points while Dani Grether added seven in the setback. Alissa Holler had 13 for the Spartans (9-7, 7-4) while the trio of Erika Linder, Carlie Craycraft and Rebekka Twine finished with seven apiece. Delaware Hayes used a string of five straight wins to balloon an early 6-5 edge into a 30-5 lead it parlayed into a 66-11 dual-meet win over visiting Worthington Kilbourne Thursday night. After a forfeit at 120 made it 12-5, Paulo Sferella (126) pinned the Wolves’ Sebastian Pinzon in 2:29, Zack Raquepaw (132) beat Sean Hoffman 4-2, Zach Williams (138) forced Luke Compton to the mat in 1:46 and Tristan Burton (145) blanked Alexander Rader 7-0 to put the Pacers in control. Emmett Cain (160) and Corbin May (182) also picked up wins for Hayes.